Man, it’s weird watching a completely scripted, drama free rap battle where we know deep down that all the participants are good friends, but then again, what, we’re going to say no to The Muppets? They’re America’s greatest entertainers! 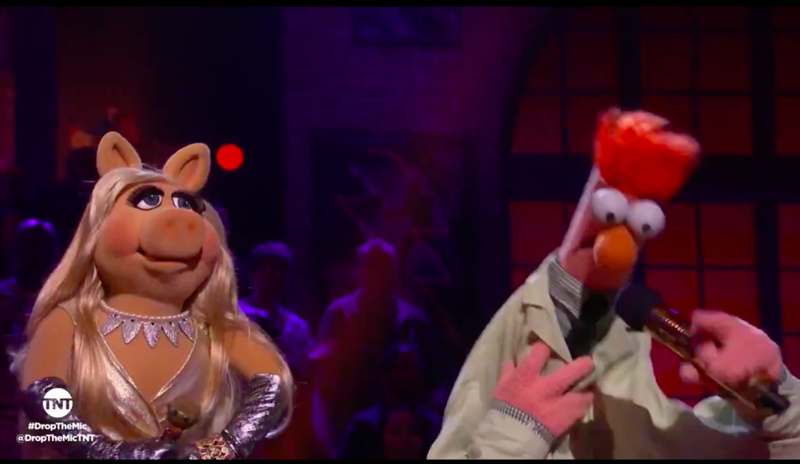 So lo, and behold, Pepe the Prawn and Kermit the Frog in a deathly no holds barred rap battle against Beaker and Ms. Piggy on TBS’ Method Man hosted Rap Battle show, “Drop the Mic”. Well, it’s time to make the music, light the lights, drop the rhymes and drop the mic! Check out the video of the Muppets pretending they could ever have any real conflict rather than being puppeteers who wrote these ahead of time who have to then go back to work with each other, and were they actually to hurt anyone’s feelings, it would result in an extensive HR meeting. So, Kermit clearly has no idea what a rap battle is meant to accomplish, and instead showers his colleagues with niceties, which shows Kermit is more plugged in to the more two faced fake nice, destroy you in subtle ways aspects of the culture than anyone else. Hey look, you can hate on his method, but when’s the last time you’ve all ever stood up to anyone? Yeah, exactly. Ms. Piggy then proceeds to drop some beats, the most exciting of which is when she talks about how Kermit peaked as a meme, which is both harsh and hey, nothing to sneeze at. He’s the Tea Lizard! Leave him be! Pepe then drops a few rhymes about Ms. Piggy calling her fat, which I doubt considering she is but a puppet, and then Beaker goes crazy speaking in meeps, apparently dropping something so offensive it shocks even the debaucherous Pepe finds offensive. In the end, Kermit and Pepe get third place, Ms. Piggy and Beaker get second, and of course, you get first for being the true winner here: the guy who watched the video. Follow us on Twitter at @WhatsTrending for more, and check out our video about Sesame Street presenting the first homeless Muppet.